Frank Simon comes from Boyle, Co Roscommon in the Northwest of Ireland. He is a self taught guitarist and composer. He spent many years in London playing all types of music on the West End Club scene. For a number of years he was the lead acoustic guitarist with the “Bully Wee Band”, with whom he recorded two albums of Irish and Scottish music. Frank Simon comes from Boyle, Co Roscommon in the Northwest of Ireland. 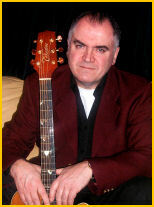 He is a self taught guitarist and composer, with wide ranging musical influences and tastes. While his main instrument is the guitar, he composes quite a lot at the piano. He spent many years in London playing all types of music on the West End Club scene. For a number of years he was the lead acoustic guitarist with the “Bully Wee Band”, with whom he recorded two albums of Irish and Scottish music. While in London, he composed music for the documentary film “Jack Charltons Angling Ireland”, which was shown on Channel 4 and RTE Television. He eventually returned home to Ireland, where he immersed himself in the demanding art of playing traditional Irish Music on the guitar, a style which he calls “Irish Flatpicking”. Frank attributes his style to the influence of fiddle and flute players. At the annual Summer School in Tubbercurry, Co Sligo, Frank taught classes in “Irish Flatpicking” for several years. He has also taught classes at Ceolaras Coleman, www.colemanirishmusic.com a Centre for excellence in Traditional Irish Music, which was built in memory of the great Sligo fiddle player Michael Coleman. In parallel with teaching and performing came the recording of Frank's much acclaimed acoustic guitar album “Slipstream”. On this, his first solo recording, Frank flatpicks his way through the twelve tracks of blazing reels, jigs, and hornpipes, in his own highly developed style. This album delivers a feast of musicianship, and a treat of listening.